A Bahamian restaurant owner who lost a fortune as a result of the Fyre Festival debacle has recouped nearly all of her losses after a GoFundMe campaign raised more than $167,000. The owner, MaryAnn Rolle, 55, was featured in the Netflix documentary “Fyre: The Greatest Party That Never Happened,” one of two documentaries released this month that chronicle the 2017 music festival disaster, which left attendees stranded without food or drinking water and sleeping on beaches in makeshift tents. The other new film is Hulu’s “Fyre Fraud,” which also takes a critical look at the festival and its organizers. 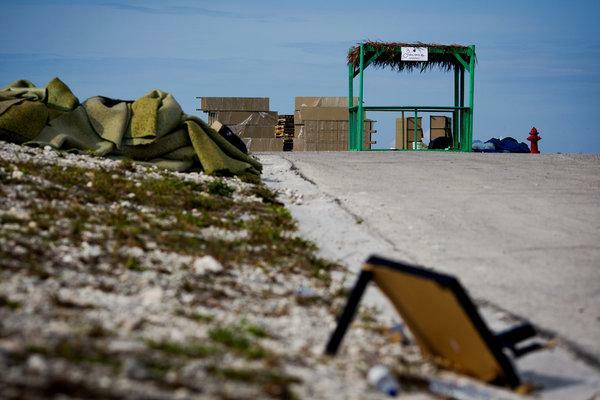 Well-heeled festivalgoers were cheated out of tickets costing hundreds or thousands of dollars, and local islanders were not paid for their services in building the infrastructure for the festival on Great Exuma in the Bahamas. In the Netflix documentary, Ms. Rolle explains that she spent $50,000 of her savings and received no compensation from festival organizers. In May 2017, she told The New York Times that she was owed $134,000 by festival organizers. She said her credit had been ruined. Ms. Rolle catered 1,000 meals per day from her Exuma Point Beach Bar and Grill in April 2017, delivering food to Coco Plum Beach and Rokers Point, where the festival’s main events were scheduled to take place, according to the GoFundMe campaign, which Ms. Rolle and her husband started. Festival organizers visited her restaurant and stayed at the Exuma Point Beach Resort. The festival was scheduled for two weekends starting in late April 2017 and was promoted by the rapper Ja Rule. It was hyped by some of Instagram’s best known influencers, including the models Kendall Jenner and Bella Hadid. Ultimately the event was canceled. The festival’s organizer, Billy McFarland, was sued and charged with defrauding investors. In October, the entrepreneur was sentenced to six years in federal prison. The festival’s promotional videos displayed the Bahamas’ white sandy beaches and featured models in bikinis lounging on sailboats and swimming along the island’s azure shore. But when festivalgoers arrived on Great Exuma — the organizers’ last-minute choice — the staff was woefully unprepared. Headliner bands like Blink-182 had canceled. Monsoon-like rains had soaked the tents where people were supposed to camp. Some guests, who had been promised meals by star chefs, were served sliced cheese on bread. This week, Ja Rule posted an apology to Ms. Rolle on Instagram, writing, “MaryAnne Rolle we’ve never met but I’m devastated that something that was meant to be amazing, turn out to be such a disaster and hurt so many ppl.” Ms. Rolle said she did not know if he had donated money to her campaign.